There's something that we've been pondering for a while now. 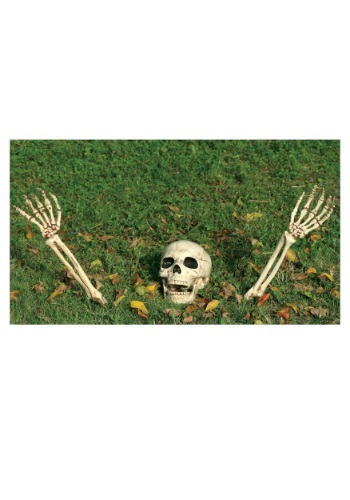 Why does Home and Garden magazine never feature human remains decorating opportunities in their October issue? Everyone knows unique variations on the classic spooky skeleton is the only way to keep your fall décor fresh. With our 3 piece skeleton you'll cause your neighbor's to come up with their own questions. Such as, "Is that skeleton sinking to it's dark fate, or rising from the dead?" They might also ask, "How can I ever compete when my neighbor's yard is so darn chic?" The realistically painted bones make your skeleton stand out in a world of bleached and sadly cartoonish skulls. The skull's open mouthed expression seems to form a grin that is permanently welcoming the Halloween season. Maybe you'd like more back story to your skeleton set. Feel free to set this skeleton in a sandbox and put an explorer hat on the skull, for that died in quicksand look. Also try placing your skeleton set in freshly turned flower beds for an undeniable fresh grave appeal. You'll find the opportunities for weird decorating fun are virtually endless. This three piece set is easy to install with steaks attached to the ends of the arms to keep them in an upright position. This skeleton strives to be useful, if you'd like to show where to get on the path of horror or that there is bowl of candy on the porch, both the arms and wrists can bend, so your skeleton buddy can tell passerbys the way to go. Go ahead, get creative with some spine tingling décor this year.